Off to Asia - have I forgotten anything? Home > Pentax User Forum > General Photographic Chat Forum > Off to Asia - have I forgotten anything? I'm going to take a trip around parts of Asia in a couple of weeks and will be away just under 4 weeks. I'm planning on travelling as light as possible so won't be overloaded with equipment. At the moment I'm going to take my K-r with just the Pentax 18-250mm and my FA 50mm 1.7. I have three batteries and three class 10 8gb cards. Most days I should be able to re-charge batteries and download the days photos onto my netbook. I have a polariser for the 18-250, but not for the FA 50. I don't have any lens cleaners yet or any form of dust blower, though I'm more likely to blow dust in rather than out if I do get one. I have a Kata backpack which has room for the photo equipment and also acts as a day pack. The one obvious glaring omission is a tripod - trying to decide between a Redsnapper 284 or a Vanguard alta pro 263AT, but also a little concerned about the additional weight. Any thoughts on anything I might have missed would be appreciated. I'm going to be in very modern cities right down to very rural areas. I'd take a rocket blower if you don't have anything else, but you will want to pack it in your hold luggage rather than your backpack as I always get stopped going through security if I've left it in my camera bag. A gorillapod my be an option for a small lightweight tripod as neither of your lenses are very large or heavy it will easily cope with that, though I don't know anything about the two you suggested. If possible I'd consider a wide angle lense as well for the cities, trying to capture a church, etc in narrow streets can be difficult. I have been considering a gorillapod as well, but the metal focus one is as expensive as a full size tripod. I had a smaller gorillapod with my bridge camera, but didn't use it that often. There is a cheaper dslr zoom version, but not sure how strong this would be or how stable as I like night photography. I forgot to mention that I also have a Think Tank holster which takes the K-r with the 18-250 attached and the hood in place so I don't need to keep removing the backpack. If you don't want to carry a tripod, a beanbag? I always carry one with me when I'm travelling. More often than not, I take a tripod and end up putting the camera on a rock or up against a tree hand-held. Recently I've taken to carrying small sandwich bags, which can be filled with sand or dirt and make the best tripods ever! My SLR gorillapod only ever gets used for holding lights - it's almost useless as it vibrates and bounces even with mirror slap. Personally, I'd have to have a super-wide, and I probably wouldn't bother with the 50mm. 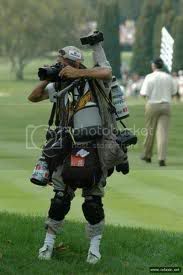 But I would definitely not take a tripod, that's worth 3 lenses in weight. Thanks for the suggestions. I obviously need to have a think. A beanbag seems a good idea, just not always possible to get the height I suppose. I've thought about a monopod, but hand held is pretty good anyway with the IS and I can't see a monopod helping with long exposures. I'd love a super-wide, but don't have the pennies having paid for the trip. I'm taking the 50mm because it's small and light and useful if I want to take photos in low light. Also a bit more unobtrusive if I'm asking locals if can take portraits. I daresay whatever I take this time won't be perfect, but each time i get it wrong I'll learn something. No wonder he's wearing knee pads. Some filters and spare cards. I do like slow shutter speed photography, so feel putting a tiny tripod in there is important... It's cheaper than alternatives like the Gorillapod, and a lot more useable despite being a bit short compared to a regular tripd. Just bought one of the double bean bags which will fit over a car window or fence etc. A bit bulkier than a tripod, but much lighter and an awful lot cheaper. I can't see many places where this wouldn't work as well as a gorillapod. Obviously it will have limitations compared with a tripod, but i'' work around that. If you're travelling around the big cities, remember to leave some roome to bring additional kit BACK! I will be looking, but suspect that the Far East prices aren't quite the bargains they used to be. I'll be in Mumbai, Kuala Lumpur, Singapore and Bangkok at various points so it will be good to compare. Won't have any money left by then, though.